Collecting photography is an expression of aesthetics. There are some remarkable photographers out there, creating works that we want to live with and enjoy for years. 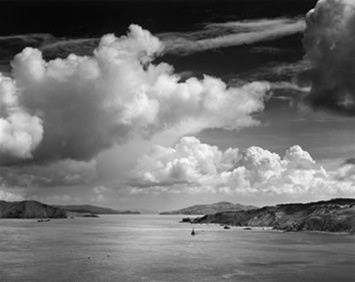 At The Ansel Adams Gallery, we feel strongly that the art work we live with on a day to day basis has an impact on the psyche, and that strong positive photography will develop a positive emotive response. We haven’t found psychological studies to back that up, but do feel there is enough anecdotal evidence to make the statement. That said, we recommend a little structure and discipline to collecting, and have developed this section to help you. We will attempt here to explain the structure of the market for photography, what to look for, what to watch out for, and generally raise the level of understanding. Buy what you love. Don’t buy purely for the sake of investment. Hopefully the work will be on your wall and appreciated for years, even if it doesn’t appreciate in value. Know what you are buying. Familiarize yourself with the work of the artist. Many artists collected on the secondary market have different bodies of work with different qualities that may be appreciated differently, and will have different values. Know what the medium is, a silver gelatin print is not the same as a collotype. “Print” has a different meaning to different people. Please see our glossary to verify what we are talking about. A “Special Edition of Photographs” stamp on the back of a signed Ansel Adams photograph means that it is NOT original, but produced by an assistant under his supervision. Know what the edition is. Editioning is a modern construction to offset the fact that a mechanical or semi-mechanical process allows for an unlimited number of identical or closely identical prints. Photographers as early as Edward Weston limited some works to a certain number (unfortunately with Edward his work was not widely popular while he was alive and most, if not all, of the editions never filled). Ansel editioned his portfolios, but never any prints. He did destroy some negatives after printing the portfolio, but always regretted the destruction, not the lack of access. Different artists edition differently: some limit per image, some per size of image, some are not limited or identified at all, some are numbered but not limited. Usually the editioning is priced into the print, but it is still better to know what it is than to find out later that it isn’t what you thought. Know what the condition is. Buy from someone who will stand behind the work and the sale.